The Mayor OF Elmbridge Presents Friday Night Is Music Night! Cobham will be filled with the sound of glorious music on Friday 6th April 2018, as ACS International School plays host to the Mayor’s Charity Concert in support of Oasis Children’s Charity. For more information about Oasis and the help they offer to those in need please use the button below to see our page for the charity. Featuring performances from three superb local musical ensembles – Weybridge Male Voice Choir, Elmbridge Choir and the 1st Claygate Scout and Guide Band – a hugely entertaining evening is promised. The renowned Weybridge Male Voice Choir (photo below)enjoys a well-deserved reputation for the quality and high standard of its performance and is now under the inspired musical direction of Jonathan Kilhams. Drawn from Scouting and Guiding movements across Claygate, the talented youngsters of 1st Claygate Scout and Guide Band, aged 8 to 18 years, perform a wide repertoire from traditional marches through to music from TV and film. 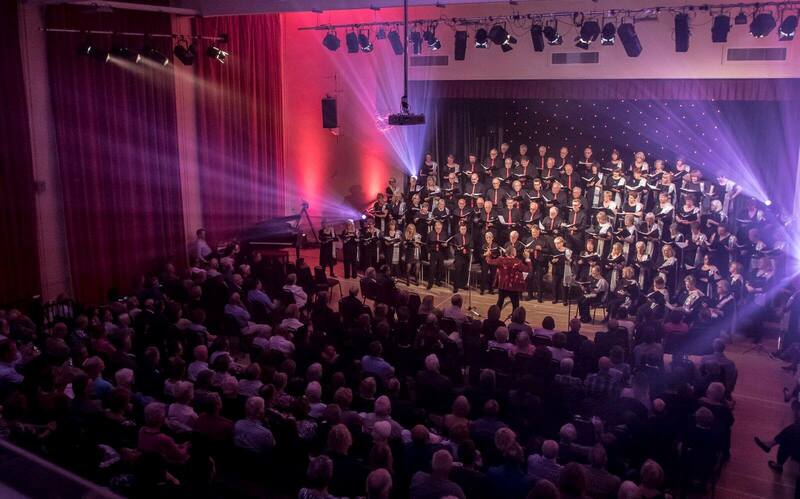 The impressive 140-voice Elmbridge Choir, (top photo) part of Surrey Music, regularly performs charity concerts in Surrey and has helped to raise in excess of £170,000 for worthy causes over 12 years. Includes complimentary glass of wine at the interval.